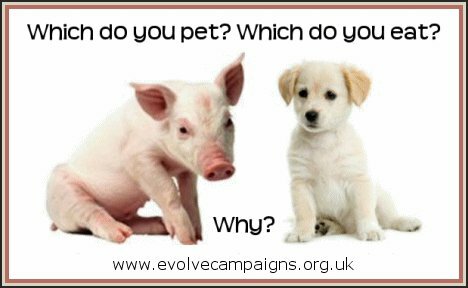 When we tuck into a bacon sandwich, few of us wonder what has happened to the other parts of the pig whose life has been sacrificed so we can enjoy a juicy breakfast. But one inquisitive writer set out to trace where all the body parts of one porker ended up. dentified by its yellow ear tag number, 05049, her pig trail ended with her identifying an incredible 185 different uses to which it was put – from the manufacture of sweets and shampoo, to bread, body lotion, beer and bullets. She found that 4.9lbs of her 16st 3lb pig went to making wine gums, while 4.8lbs went into liquorice. In this process, collagen is taken from the pig and is then converted into gelatine. This finds its way into numerous foodstuffs, where it acts as a gelling agent. Although not all sweets in the UK contain pork gelatine, many do – including Marks & Spencer’s hugely popular and aptly-named Percy Pigs sweets. It is not only sweets that contain pork gelatine. In some beers, wines and fruit juices, pig gelatine is used to remove the cloudiness from the drink. It works as a clarifying agent by reacting with the tannins in the liquid and absorbing the cloudiness. Some ice creams, whipped creams, yoghurts and certain butters also contain gelatine, as do certain pet foods. More surprisingly, a number of medicines also contain pig gelatine – everything from painkillers to multivitamins. Christein, from Holland, found that while some companies were reluctant to cooperate in her quest, others claimed that they didn’t even realise their products contained elements taken from a pig because of the middle men involved in the complex distribution process. The confusion is not helped by the fact that it is not clear on products’ ingredient labels where they originally came from. According to the Food Standards Authority, there is no legal obligation for manufacturers to specify whether the gelatine they use is from a pig or another animal. When it is specified, it is often confusingly referred to as Suilline gelatine. According to Richard Lutwyche – a British pig farmer with more than 60 years experience, chair of the Traditional Breeds Meat Marketing Company and a member of the British Pig Association – the reasons for much of this confusion is due to the industrial-scale of much pig farming. 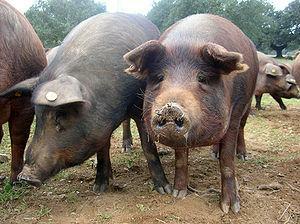 ‘In the UK, big commercial farms send their pigs to large abattoirs. The abattoir will find different markets for all the by-products,’ he says. ‘Everything they can’t sell they have to incinerate, so it’s in their best interest to sell as much as they can. Some makers of cigarettes use haemoglobin from pig’s blood in their filters. Apparently this element works as a sort of ‘artificial lung’ in the cigarette so, they claim, ‘harmful reactions take place before the chemicals reach the user’. And the next time you buy a loaf of bread you would be well advised to read the packaging. Some manufacturers use an ingredient called L-cysteine, which is a protein made from pig or other animal hair and which is used to soften the dough. A product like Tesco’s Plain Tortilla Wraps includes this ingredient. 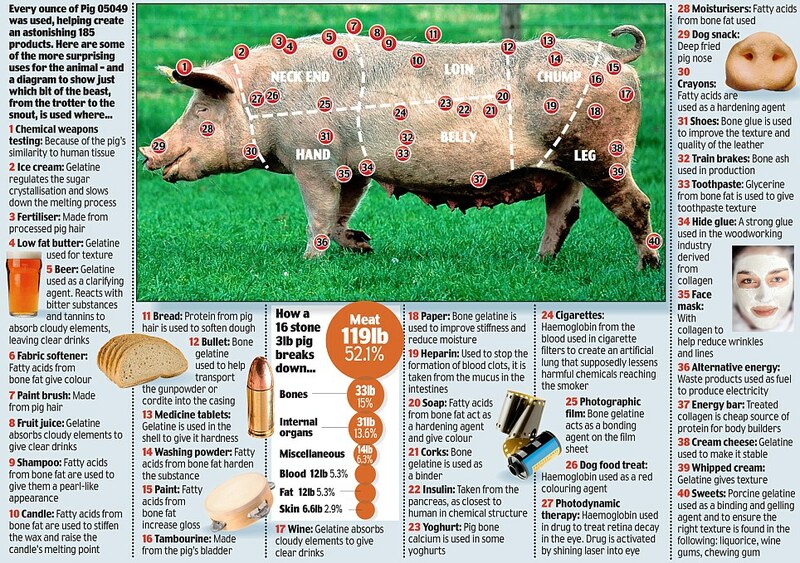 The strangest use for a pig by-product that Christein found was in bullets and explosives. Pig bone gelatine was used to help transport the gunpowder or cordite into the bullet. It is difficult not to be impressed by the sheer versatility of this animal and its parts. Virtually nothing in a pig goes to waste. The snout from Pig 05049 became a deep-fried dog snack, while pig ears are sometimes used for chemical weapon testing due to their similarity to human tissue. Tattoo artists even buy sections of pig skin to practise their craft on due to its similarity to human skin, while it is occasionally used with burns patients for the same reason. Pigs make an enormous contribution to medicine, with insulin, the blood-thinning drug heparin and pig heart valves all vital. However, for vegetarians, Jews keeping kosher, Muslims and anybody else wishing to avoid pig products, this may not be such good news. The complex workings of the global food and processing industry have ensured that it is almost impossible to avoid pig altogether. La réponse de Gary LFrancione à une déclaration d’Ingrid Newkirk. Bien que je supporte entièrement PETA parce que pour le moment aucune autre organisation en France n’envoit les messages sur le végétaLisme, je comprends la position de Francione sur le veganisme. Nous voyons autour de nous trop de gens (en France) qui militent pour les droits des animaux tout en parlant avec larmes du végétalisme et qui pourtant lorsque nous lisons leurs blogs ou leurs commentaires sur des artilcles traitant de la souffrance animale, mentionnent manger “de temps en temps” des viandes animales, ou “ne pas pouvoir se priver de fromages ou de laitages animaux”. Rester dans la tolérance d’un mauvais juste milieu ne fait que cautionner les maltraitances animales même si c’est indirect. First, Newkirk repeats the mantra of the new welfarist movement: that animal welfare reforms actually reduce suffering. The reforms that are promoted by PETA and the other new welfarist groups for the most part do not provide significant welfare benefits for animals. They just represent a different form of torture. Waterboarding someone on a bare board and waterboarding them on a padded board is still waterboarding. Moreover, for the most part, industry would eventually adopt these reforms anyway because they generally increase production efficiency. Giving slightly more space to veal calves or using alternatives to the gestation crate result in increased animal productivity, lower veterinary costs, and a better bottom line for producers. PETA explicitly recognizes that gassing chickens is an economically efficient thing to do. The symbiotic relationship between large animal groups and institutional exploiters is clear when we see that groups like PETA and institutional exploiters are involved in a drama whereby animal advocates target an economically vulnerable practice; industry puts up a token fight; the reform, or some modification of the reform, is eventually accepted because it does not harm, and usually helps, industry; the animal groups declare victory; the animal exploiters bask in the praise that industry gets from animal advocates. Only the animals lose. Second, Newkirk conveniently ignores that the relentless promotion of these welfare reforms by PETA and other new welfarist groups and the claims that these reforms make exploitation more “humane” make the public feel more comfortable about consuming animals and, as a result, consumption increases. It is interesting to note that per capita consumption of animal products is going up and not down. When groups like PETA give an award to slaughterhouse designer Temple Grandin, or praise animal flesh/products peddlers, or call off the boycott of KFC in Canada because KFC agreed to phase in buying gassed chickens from producers, what does that say to the public? It is nothing less than one big stamp of “animal rights” approval. PETA has made it possible for people who eat at KFC in Canada or at McDonald’s, or who buy “happy” meat or other animal products at Whole Foods, to proclaim themselves as “animal rights” advocates. It should be increasingly clear that the “happy meat/animal products” movement is a giant step backwards. Third, Newkirk conveniently misses the most important point in the debate whether to pursue a clear vegan moral baseline or instead to pursue welfare reforms. It’s a zero-sum game. That is, we live in a world of limited resources. Every cent of money; every second of time; every bit of effort that we devote to welfare reform is less money, time, and labor that we devote to clear, unequivocal vegan advocacy. If the large new welfaist corporations put all of their resources into vegan advocacy, they could reduce suffering and death by reducing demand and helping to shift the paradigm away from the notion that animals are things that we can use if we treat them “humanely” to the notion that animals are beings with inherent moral value whom we should not be using at all. Consider the following example: you have one hour to spend today on animal advocacy. Should you spend that hour educating people about eating cage-free eggs or about not eating eggs (or animal products) at all? You cannot do both and to the extent that you tell people—as these organizations do—that they can satisfy their moral obligations to animals by eating cage-free eggs or other “happy” animal products, you virtually guarantee that the best that will happen is that people will choose a different form of torture rather than no torture at all. The choice is not, as Newkirk suggests, between reducing suffering or promoting veganism. It is only by promoting veganism—by working on the demand side of the equation rather than the supply side (the focus on welfare reforms)—that we will reduce suffering—and death. A related point is that it is not just suffering that matters, as Newkirk suggests; killing matters as well. Newkirk apparently buys into Peter Singer’s view that animals for the most part do not have an interest in continuing to live but only have an interest in not suffering. I reject this view as a factual matter. To deny that any sentient being has an interest in continuing to live is absurd. All sentient beings prefer, or want, or desire to continue to live. The welfarist position, which Newkirk and Singer accept, is that animal life per se has no moral value. Perhaps this accounts for why PETA kills most of the animals it takes in at its Norfolk facility. In any event, I reject that view as speciesist. As long as the issue is how we treat animals, as long as we think that we are justified in exploiting them as long as we treat them “humanely,” and not that we cannot justify animal exploitation, however “humane” it is, the paradigm will never shift. Fourth, I understand why animal businesses like PETA promote “flexitarian” principles and are hostile to veganism. They want the biggest donor base possible. According to a PETA executive, half of PETA’s membership is not even vegetarian. If you want those people to make contributions and leave you in their wills, you need to make them feel good about their continued exploitation of animals. If you want to hobnob with Hollywood celebrities and other famous people who consume animals, you cannot have a clear vegan policy. So, instead, you have a position that includes everyone but, precisely because it does not rule out any behavior as morally unacceptable, the position means nothing. The moral schizophrenia is astounding. PETA routinely condemns institutional animal exploiters but then fails to acknowledge that the consumers who demand animal products—including all those PETA members who are not vegan—are the animal exploiters who create the demand in the first place. It is a matter of concern when those who cry the loudest that veganism is difficult or daunting are so-called animal advocates. Please understand I am not questioning Newkirk’s sincerity. I just sincerely believe that she is very, very wrong. If you are not vegan, please consider going vegan. Don’t buy into the false dichotomy between flesh and other animal products. There is no morally coherent distinction between flesh and other animal products. Animals used for dairy generally live longer, are treated as badly if not worse than animals raised for meat, and they end their lives in the same hideous slaughterhouses as do their meat counterparts. Going vegan is easy (despite what some large animal organizations claim); it is better for your health; it is better for the planet; and, most important, it is the morally right thing to do. Veganism is not a matter of compassion or mercy; it is a matter of fundamental justice. Veganism is the least that we owe to nonhuman sentients.